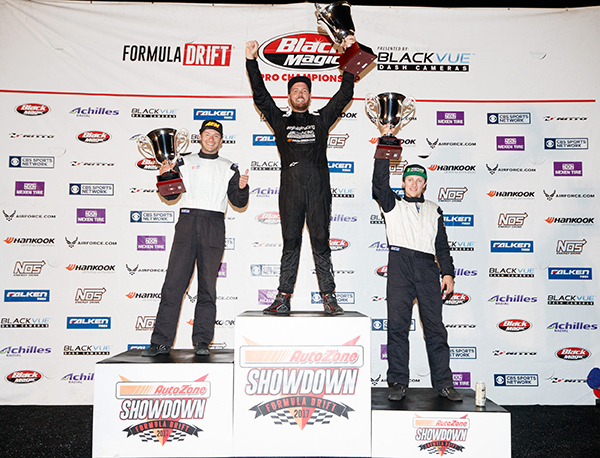 The Formula DRIFT PRO 2 season came to a dramatic conclusion at Texas Motor Speedway. 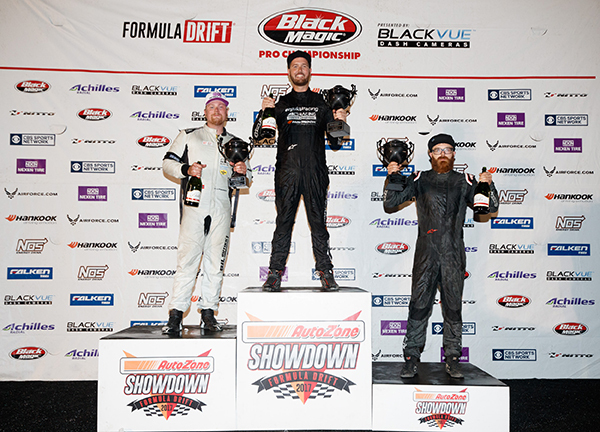 Florida native Kevin Lawrence in the Enjuku Racing / BC Racing / Hankook Tire Nissan 240 defies the odds and wins the event and the PRO 2 Championship. PRO 2 returned to Texas Motor Speedway for the final event of the season. Fans witnessed the biggest comeback in Formula DRIFT PRO 2 history as Kevin Lawrence entered the event in 5th place overall with an 81 point deficit to win the event and ultimately the championship. The championship was up for grabs when the top 4 drivers failed to move past the Top 16 bracket giving a small mathematical chance to Lawrence. In the semi-finals, Norwegian driver, Ola Jaeger in the Japan Auto Toyota Supra faced Alec Robbins in the KoruWorks Nissan 350Z. In the second run of their battle, Robbins went off line to give the win and his first podium to Jaeger. In the second semi-final battle, Lawrence met Riley Sexsmith piloting a Subaru BRZ. Sexsmith made a major mistake by going off-course on the first run to give Lawrence the advantage and eventual win to move him into the Finals to meet Jaeger. Sexsmith finished the event in third place. In the Finals, both drivers made mistakes in the first battle in which the judges called a “One more time.” In the second run of the battle, Jaeger fell dramatically behind creating a large gap that proved to be his downfall, which gave Lawrence the event victory and the championship by a mere 2 points. The PRO 2 championship finished with Travis Reeder in second place and Matt Vankirk in third place. Formula DRIFT continues to Round 8: Title Fight on October 13-14, 2017. For more information visit, www.formulad.com and find Formula DRIFT on Instagram @formulad, Facebook www.facebook.com/formuladrift, Twitter @FormulaDrift, and Snapchat – formula_drift. Tune into Formula DRIFT on CBS Sports and check your local listings for airtimes. Gryphon Automotive Labratory 2013. Awesome Inc. theme. Powered by Blogger.